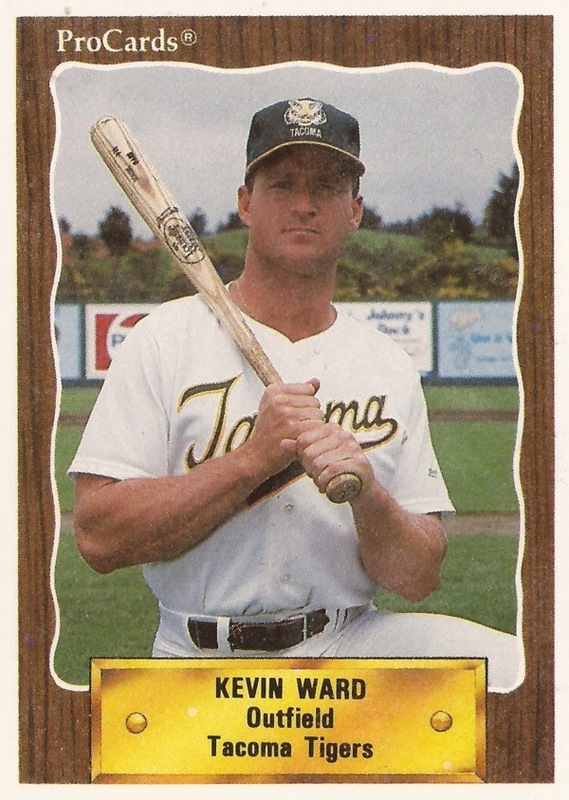 Going into his ninth professional season in 1991, Kevin Ward was also starting work with his third organization, the Padres. He'd made AAA in three of those seasons, never making the majors. Then, in May 1991, he finally made it. "I'm a Christian and I always felt that if I apply myself with the belief that one day it would lead to the major leagues, that it would happen," Ward told The Philadelphia Inquirer after his call. "My faith in God kept me going at a time when it didn't appear things would work." For Ward, it would go on to work in two major league seasons, spending all of that second with the Padres in San Diego. Ward's career began in 1983, taken by his favorite team as a child, the Phillies, in the sixth round of the draft out of the University of Arizona. He started at short-season Bend, moving to single-A Peninsula in 1984. He hit AA Reading in 1985, then first saw AAA at Maine in 1987. At Maine in June 1987, Ward hit a pinch-hit, game-winning home run against Pawtucket. "Kevin is a strong kid and is capable of hitting the ball out of the park," Ward's manager at Maine Bill Dancy told The Lewiston Daily Sun afterward. Ward returned to Maine for 1988, then moved to the Athletics system for two seasons without seeing Oakland. Then he signed with the Padres. He debuted with San Diego May 10, 1991. In July, as the Padres visited Philadelphia, Ward finally played in the majors near where he grew up. In the stands, were 30 Ward relatives, including his parents. "I just wanted to soak in the moment," Ward told The Los Angeles Times of seeing his family there. "It's still hard for me to believe. Ever since I was a kid growing up here, I dreamed about playing here. Now it happened." Ward ended up playing in 44 games for the Padres that year, hitting .243, with two home runs. He then returned for 1992, playing the entire season with San Diego, getting into 81 games. Going into 1992, though, Ward was supposed to be back at AAA and, according to The Times, he even thought of retiring. Then he got called back, and hit a late home run that proved the difference in a Padres win. "What an amazing last 24 hours," Ward told The Times after that game. "Maybe this one will keep me around a little longer. Each time they tap me on the shoulder you get a little gun shy. You think you've seen it all during your career, this is just another episode in my career." Ward ended up hitting .197 for the Padres that year, without ever playing a game at AAA. His career, tough would soon end. He returned for 1993, but got into just 23 games at AAA Colorado Springs with the Rockies, ending his career. Ward has since moved on to other careers, including the restaurant business and horse racing. By 2001, he was owner of the Greystone, a restaurant in San Diego. He was also majority owner of Greystone Racing Stable, according to the Thoroughbred Times. Of his move into horse racing, Ward told the Thoroughbred Times in 2001, "I had to replace my baseball adrenaline rush."